Black Death review - Centurion, Solomon Kane, Valhalla Rising… British horror has been getting seriously medieval on our asses lately. Now it’s Severance director Christopher Smith’s turn. Can his fourth effort find some dark poetry in the Dark Ages? Smith is a talented director, one of the great British hopes, but accusations of narrative magpie-ing dogged both Creep and Triangle, and Dario Poloni’s (Wilderness) screenplay is unlikely to provide absolution. The year is 1348 and the pestilence of the title – “more cruel and more pitiless than war” – has decimated England’s God-fearing populace. 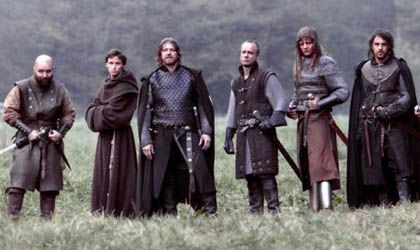 Taking young monk Osmund (Eddie Redmayne) as their guide, Ulric (Sean Bean) and his band of mercenaries are on a mission to reclaim a remote village from necromancer Langiva (Carice van Houten) – by force if necessary. It’s all in the name of The Lord, of course, but that doesn’t stop Bean and his not-so-merry-men raising merry hell along the way. The period recreation is (well, looks) flawless, the fights are suitably brutal (Bean was born to wear armour, lop off limbs and shout, “We ride at dawn!”) and Smith conjures a benighted world of witch burnings and black-toothed corpses with handheld élan. It’s only when the tragically miscast Tim McInnerny (too genial) and Van Houten (too Dutch) turn up that the film, like the protagonists, finds itself stuck. The supernatural threat they pose palls in comparison to the corporeal horrors of the plague outside – it’s hard to believe a bunch of tree-huggers could take on Boromir himself.